Travelers using U.S. airports are familiar with long lines due to TSA checkpoints, and recent reports indicate lines will get longer in the near future because of new TSA screening procedures, fewer TSA officers and other related issues. Yet, America is no safer since 9/11 because the federal government has thrown bureaucracy at the threat and entrusted our enemy inside our security perimeter instead of understanding the threat and dealing with it. The Israelis evaluate people for threats. Americans rely on technology and procedure. Recent Inspector General reports reveal 95% of contraband – including mock weapons and explosives – made their way through U.S. TSA security check points. A dangerous and ominous sign of America’s security posture. 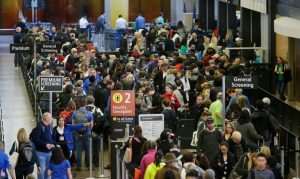 Anyone who travels frequently will also notice a high number of sharia-compliant Muslims inside the security perimeter at U.S. Airports. 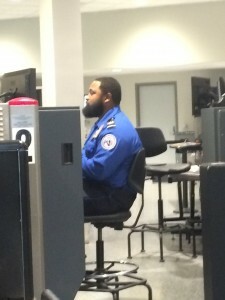 Specifically, sharia compliant Muslims can be observed: wearing TSA uniforms and manning checkpoints; working at the airlines; and working at other positions at the airport including shuttle drivers and baggage handlers. This is a recipe for disaster. 100% of all published sharia mandates jihad until the world is under Islamic rule, and 100% of all published sharia only defines jihad as “warfare against non-Muslims.” 100% of all sharia obliges Muslims to lie to non-Muslims if the goal is obligatory – eg Jihad. When someone is visibly sharia-compliant, they are a jihadi. 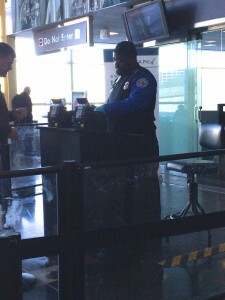 Probably not the best choice for a TSA officer. Suhail Khan (son of one of the most prominent Muslim Brotherhood leaders in America) was moved out of the White House on 9/11 to work directly for two successive Secretaries of Transportation. Hamas leader Mohamad El Sharkawy manages and trains baggage handlers at Phoenix’s Sky Harbor Airport for American Airlines. Being a member of the Muslim Brotherhood does not disqualify a person from gaining a security clearance in the U.S. federal government. When TSA tells us our security is up to us, they aren’t kidding. Diversity silencing. The shaming is working for the enemy. Security without information is Russian Roulette. As one once noticed who flew the planes, it wasn’t the Russians, but some day it could be from any country and it has happened, because any country isn’t the definition related to terror, it is a doctrine of an religion that can’t be identified. Go to any emergency room in the country, any police station, fire department, rescue squad, hospital, heck visit a military base, and diversity looms. Any country….so really who is the invader that claims victim status… don’t ask the politicians…very many have been silenced. 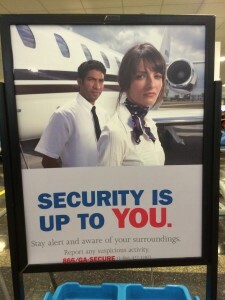 You are right, you want security, it may be hard to find and you will be called a racist along the way. Civilization jihad by our own hand and total deception. The only solution to winning a war involving fifty-two years of treasonous success reflecting incremental destruction of U.S. domestic security at the hands of embedded Muslim-Brotherhood operatives in pre-selected usurped positions of American power is to look for opportunities to actually understand the existential threat the country is facing, and to seek legitimate reasons to stand up and fight. Furthermore, when the current presidential election cycle is over, the obscene predominance of sharia adherent Muslins manning airport checkpoints, TSA’s 95% failure rate with respect to contraband discoveries and all of the other scams Islam has been using to humiliate the American people will stop. When Geert Wilders shows up at the republican convention he should be met at our airports by the overwhelming smell of FREEDOM, personified by US travellers and citizen- wearing clothes saturated by bacon grease that positively reeks of bacon. 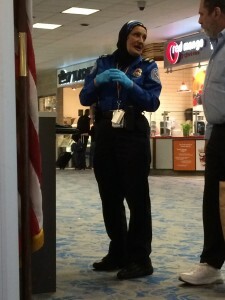 Cloth jackets that have been soaked in bacon grease should do the trick nicely serving notice to muslims in airports and at the convention that Infidels are in charge and do not accept obama bullshite at any level. Infidels should saturate their clothing with bacon grease and handle all public conveyances on every accessible surface to coat all surfaces with the overwhelming lovely odor of cooked bacon. Let us inform obautthole and all his moslem cronies that bacon smell will be everywhere. BBQ pits emitting pork BBQ smell should be all over every public place serving pork bacon and BBQ. Infidels should be clustered around mosques BBQing pork and bacon. Infidels should get together and buy semi truck loads of small pigs and release enough of 2300 piglets per truck around the convention and all mosques so that we can watch the moslems run for their souls. Several drawing competititions to draw mohammed should be all over the city while the convention is in town. Obama wants to bring in about 250,000 molslems into the USA. Let us comment where they can see that is not approved by US Citizens.